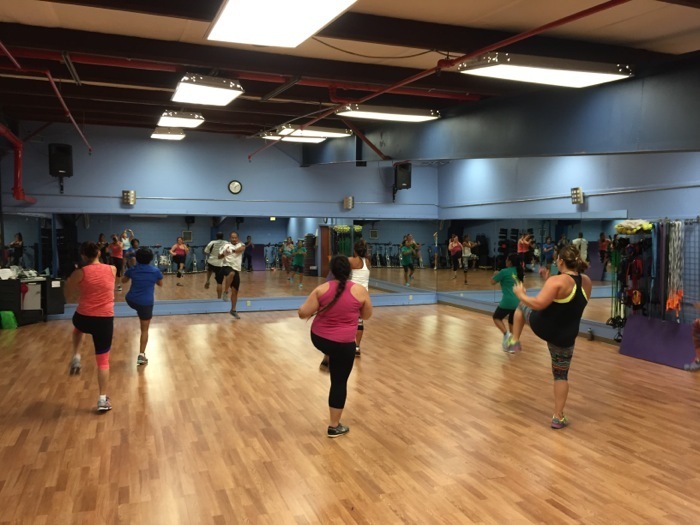 Looking for a solid gym and good selection of classes at a reasonable cost? 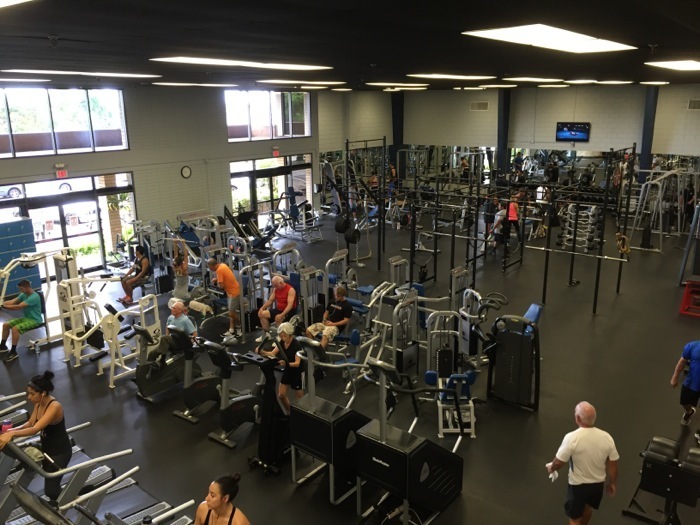 Look no further than Kauai Athletic Club. KAC has two locations, their first facility in Lihue and their most recent addition in Kapa’a. Both facilities are air conditioned to a pleasant temperature. The equipment is clean and we have never noticed an unpleasant odor there. If you are visiting Kauai, you can get passes as needed for as little as $8/pass (for 10 anytime visits in a package for $80). If you are 60 or older you can take advantage of their special senior membership rate that kicks in when you join for a month. Both locations have a complete array of cardio machines, strength training equipment and weight room essentials listed at the end of this article. 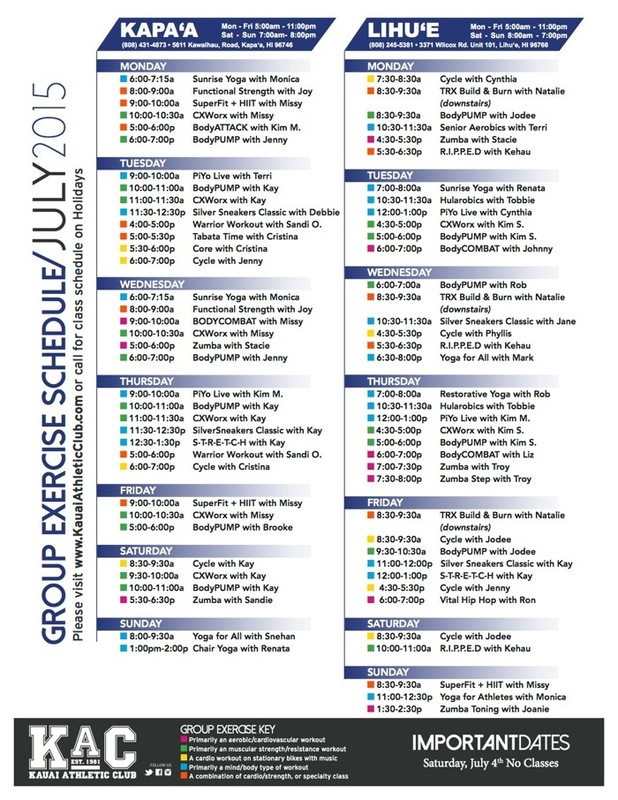 For classes you can choose from Body Pump, Body Combat, Yoga, Stretch, Piyo, Senior Aerobics, Zumba, Zumba Toning (with weights), CX Works, Build and Burn, Cycling, R.I.P.P.E.D, SuperFit with HIIT, Stretch and more. A recent schedule of classes shows a robust selection throughout the day. BodyPump is a well-recognized program. I’ve also taken it at 24 Hour Fitness in LA. They do a good job at 24 but Kim totally rocks this class. As explained on Wikipedia, BodyPump can be shortened from the standard 55 minutes to 45 or 30 minutes. You wouldn’t find Kimberly advocating that. As a matter of fact, many of her class participants take the 25 minute CXWorks with Kim just before BodyPump as a warmup. 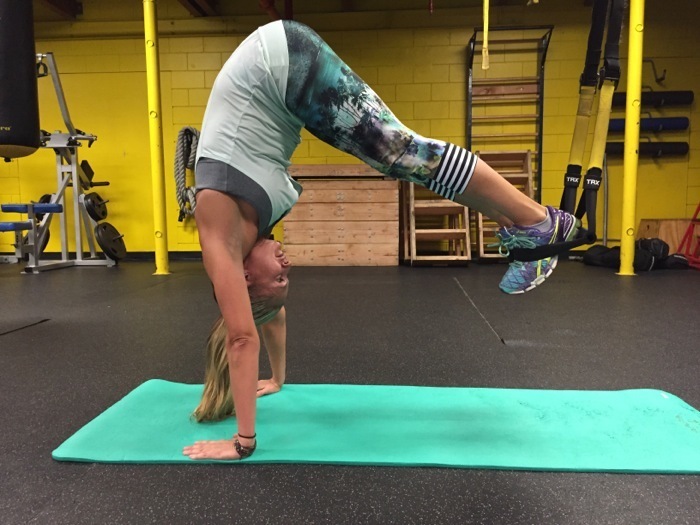 Natalie Senyk demonstrating a pike. Natalie Senyk is a strength instructor at Kauai Athletic Club who creates her own unique classes, called Build and Burn. She is also a certified personal trainer. Natalie has a Precision Nutrition Certificate which allows her to give nutritional guidance for body fat loss and muscle gain to individuals who do not have any medical conditions such as diabetes or cardiovascular diseases. 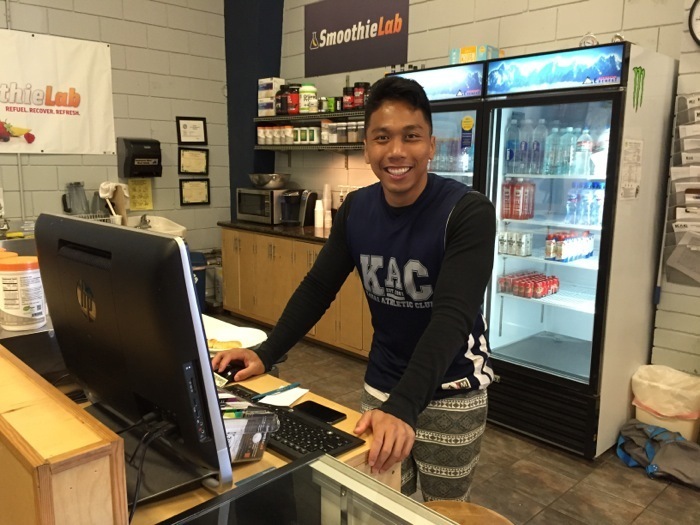 The Certified Personal Trainers at KAC offer a variety of training services including weight loss, strength training, bodybuilding, nutrition counseling, post rehab training, athletic performance training and senior training. Cynthia Rangel during a workout. Cynthia teaches cycling on Monday mornings 7:30-8:30am and is also available through KAC as a personal trainer. If you are not into classes and prefer to work out on your own, there is a wealth of equipment to do it on. 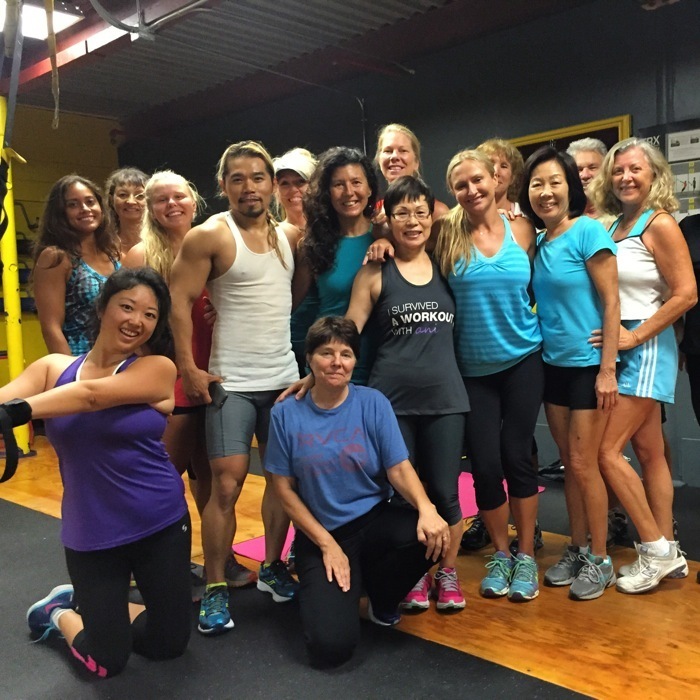 If you enjoy doing private lessons with a trainer, KAC offers that as well. This is the main floor of KAC. There are 2 other areas with equipment. 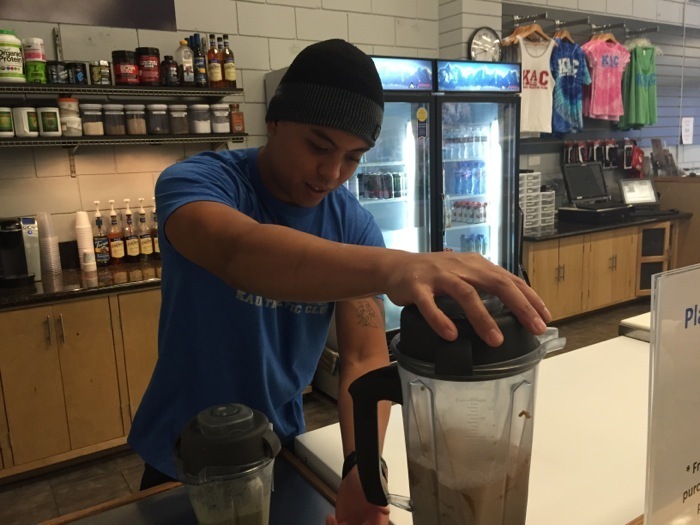 Freshly made, reasonably priced smoothies are available. 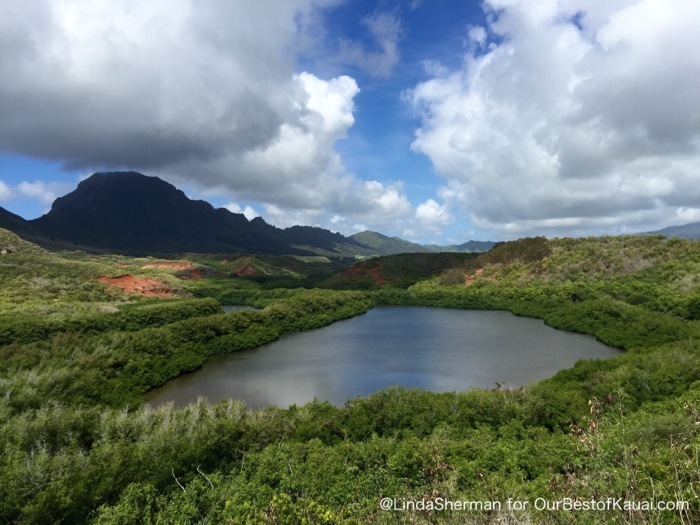 If you are a visitor and choose KAC’s Lihue location, you can visit the nearby beautiful Menehune Pond lookout on Kipu Road before or after your work-out. They have lockers and their showers are fine. They don’t have sauna, steam or pool but you need to do a huge upgrade in price to the Anara Spa at the Hyatt to get that. You are of course also near to a CostCo run, Kukui Grove Shopping Center, Kalapaki Beach and other Lihue area attractions. On the Kapa’a side, you have the Kealia Beach, the Coastal bike/hike path and Safeway. Both areas have plenty of restaurants. Don’t be concerned if you see a “no rental cars” sign in the parking lot. Those go up when cruise ships are docked next door. They will know you are using the Club facilities. You should bring your own towel and a lock to use in the locker room. Both locations have a complete array of cardio machines including Crosstrainers, Elliptical machines, Step Mills, rowing machines, bikes and treadmills. There are over 40 strength training machines from Life Fitness, Hammer Strength, Precor, Hoist, Cybex and Rogue, as well as a complete variety of cable resistance stations and a Freemotion functional cable trainer. The weight room is stocked with dumbbells from 5lb-140lb, Olympic benches, squat racks, Smith machine and all of the weight room essentials including Battle ropes, kettle bells, balls, medicine balls and BOSUs. A Rogue fitness cross training rig accommodates a variety of workout activities including squats, presses, dips, pulls, rope climbs, ring workouts, salmon ladder climb, landmine work, leg raises and TRX suspension training. Olympic lifters and power lifters will find platforms, bumper plates, jerk blocks, resistance bands, and foam rollers, and yes you can use chalk. KAC Nawiliwili also features a Jacob’s Ladder, 90 ft. turf sled track, outdoor big tires, sand bags and BOSUs. 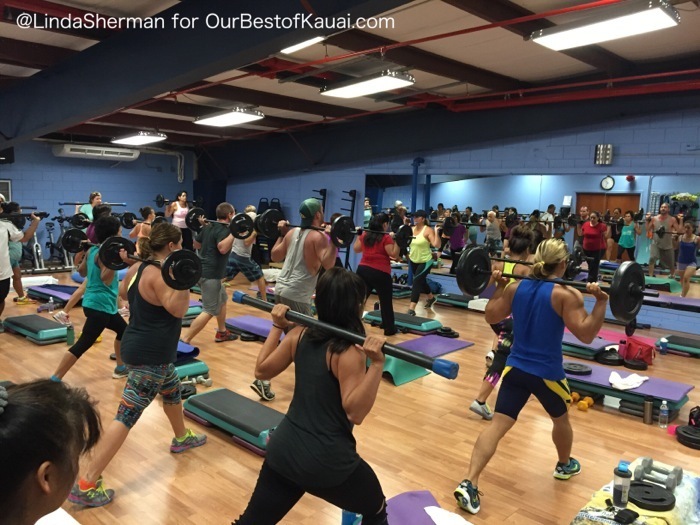 KAC Kapa’a also has GHD, Landmine, Heavy Bag, Speed Bag and Plyo boxes. All photos by Linda Sherman except for the group class shot with Instructor Natalie Senyk.